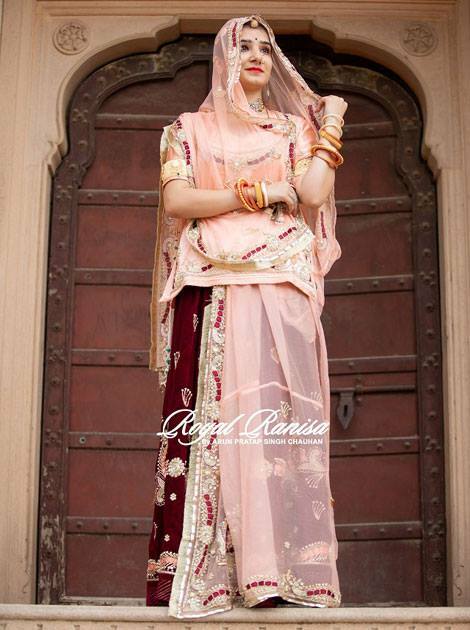 Rajputi Poshak is an ethnic and traditional dress of Rajputs wore with royalty. Dark Green color embraces the beauty of every woman. 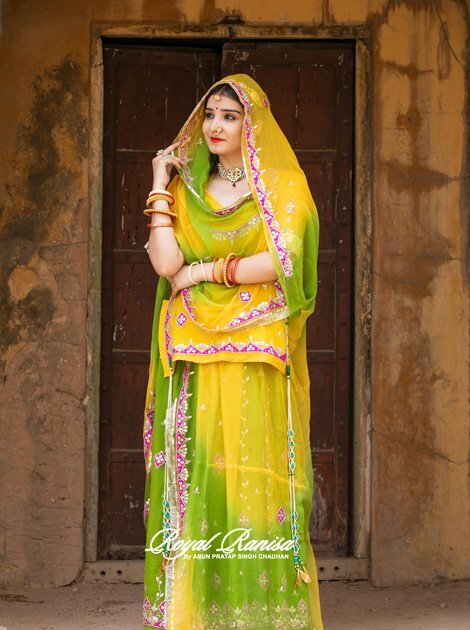 Your personality will surely enhance when you drape this Dark Green Rajputi Poshak. 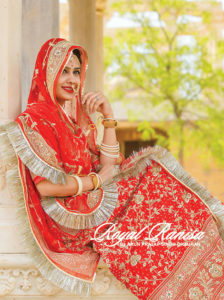 At Royal Ranisa you will find the Rajputi Poshak at the prices which is worth. Green has great healing power. It is the most restful color for the human eye. 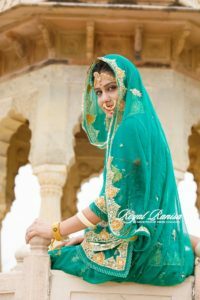 Wearing it gives peace to the soul and looks pleasant to everyone around you. 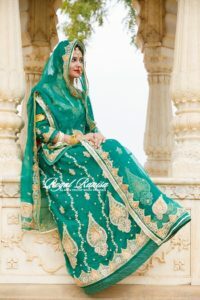 Dark green color Rajputi Poshak is worn by women on the very famous festival of Rajasthan – TEEJ. Every woman chooses to wear green on this occasion. 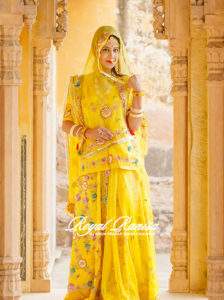 At Royal Ranisa, we have designed this Green Royal Rajputi Poshak and have tried blending the work with ethnicity. Green Rajputi Poshak will surely leave you amazed with its ever so beautiful work on it. 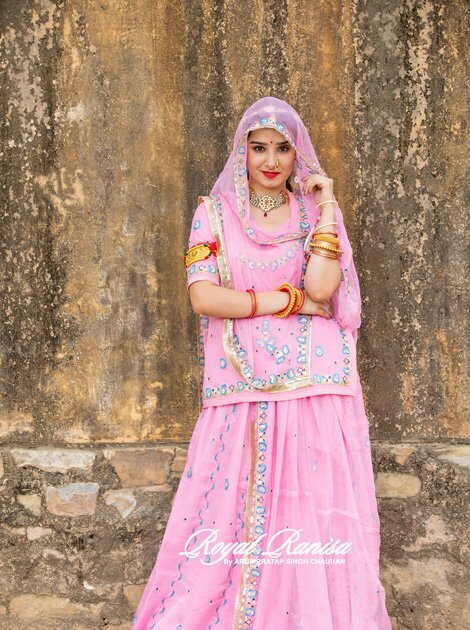 The Odhani, Kurti, and Lehnga of Rajputi Poshak are made up of pure satin fabric. Keeping in mind the festival mix Kundan Work and Gotta-Patti work is handcrafted on Rajputi Poshak. It is difficult to find such Rajputi Poshak in Jaipur. 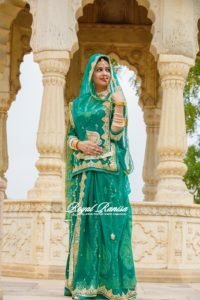 After a lot of taste test with our clients, we have come up fine green color Royal Rajputi Poshak.